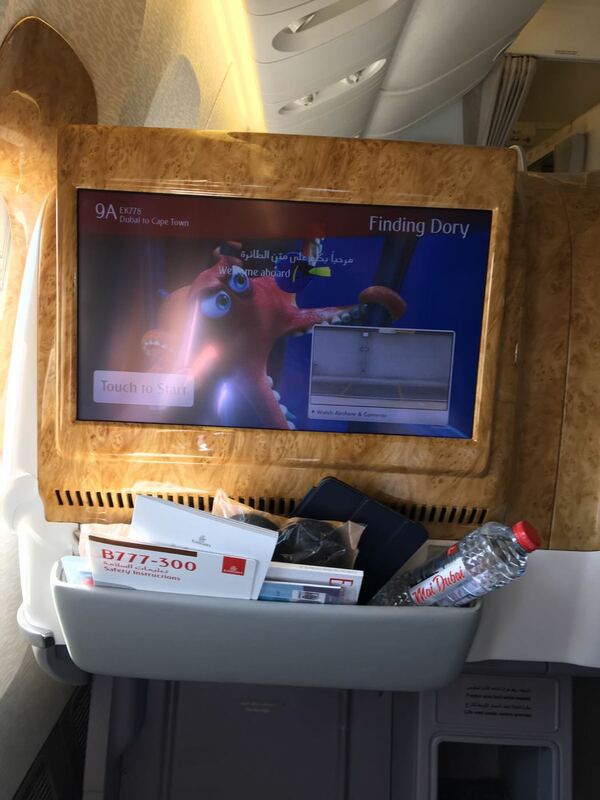 In October 2016 I flew Emirates business class from London Heathrow to Cape Town via Dubai. 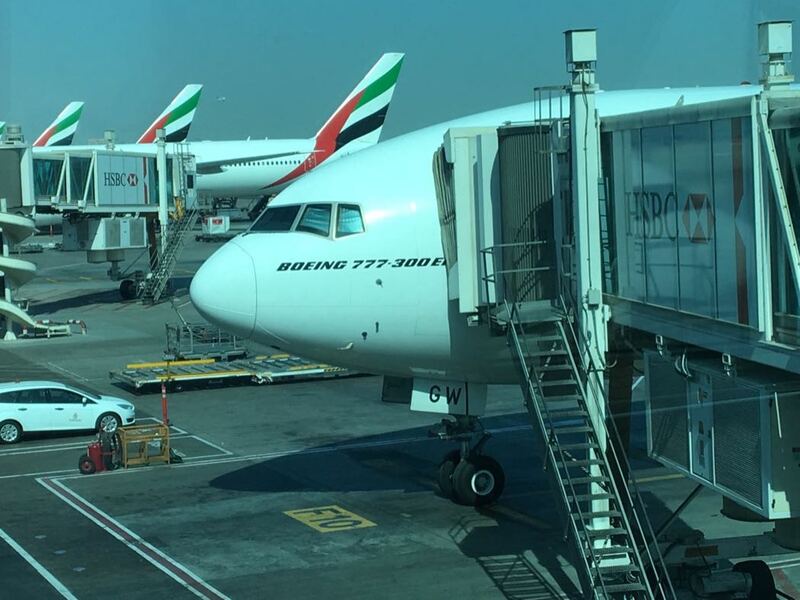 The first leg of the journey from London Heathrow to Dubai was on an A380 and the second leg from Dubai to Cape Town was on a Boeing 777-300. 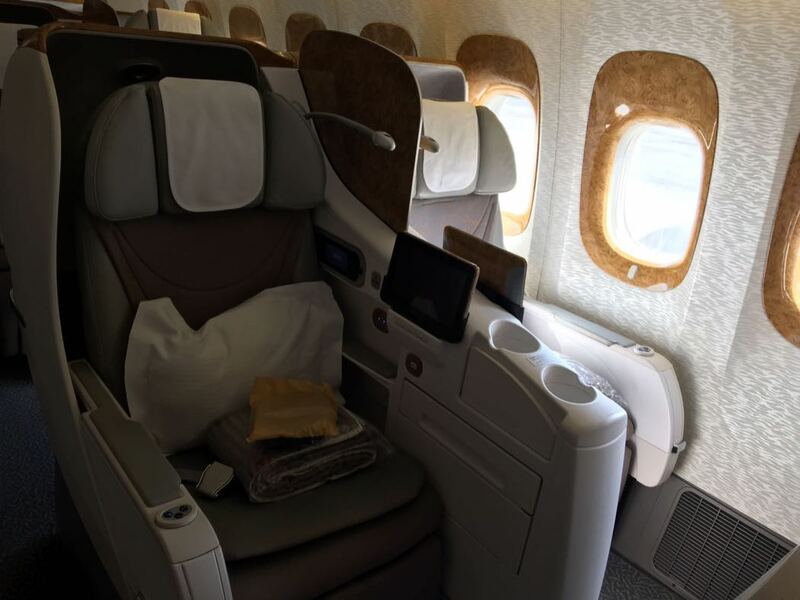 Emirates features in my top 10 best airlines for longhaul Business Class and I have also reviewed the Emirates business class on the Boeing 777 and the Emirates A380 previously along with Emirates in First Class. The Boeing 777-300 is a long range, twin aisle, twin-engine jet manufactured by Boeing, the American aerospace company. Emirates have 12 B777-300s in their fleet. The cabin on the B777-300 was still a beautiful environment, but did have a more old-fashioned feel than the A380. It is a smaller plane so was not as open and spacious. One of the key differences between the two flights was that on the A380, the business class seats lie fully flat – and this was a real highlight of the A380 flight – whereas, on the B777-300 the bed is not quite fully flat; although as angled beds go, it is probably the most comfortable that I have slept on! There is a flap at the end of your feet that you can put across to stop you sliding down, this does work well, but it would have been better to have been lying flat. 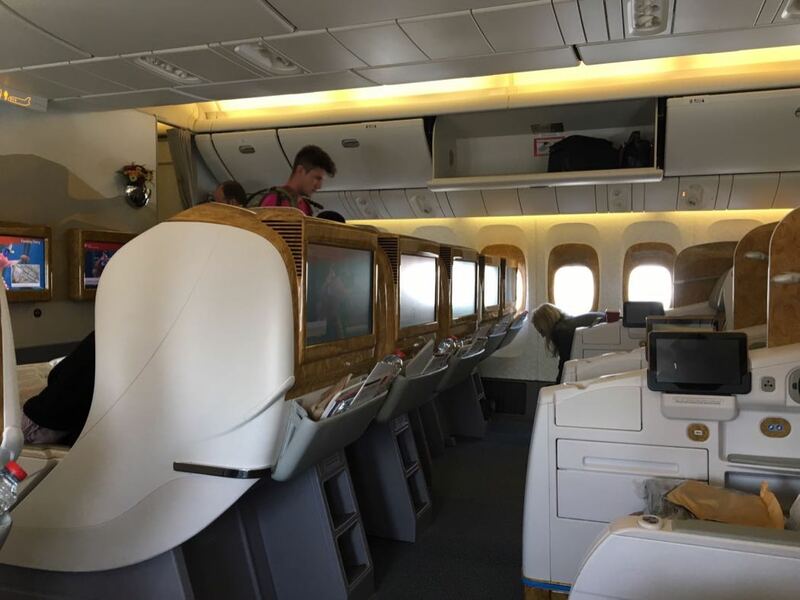 There are also lots of breaks in the seat, they do come around and offer you a thin mattress topper which covered in pristine white linen (they will, of course, put them out for you and in fact they did this on both the flights) so this helps, but the bed it still not quite up to A380 standard. The seating layout is the much more standard 2-3-2 seat configuration, the seats are right next to each other with a privacy screen in between which you can retract as you require. 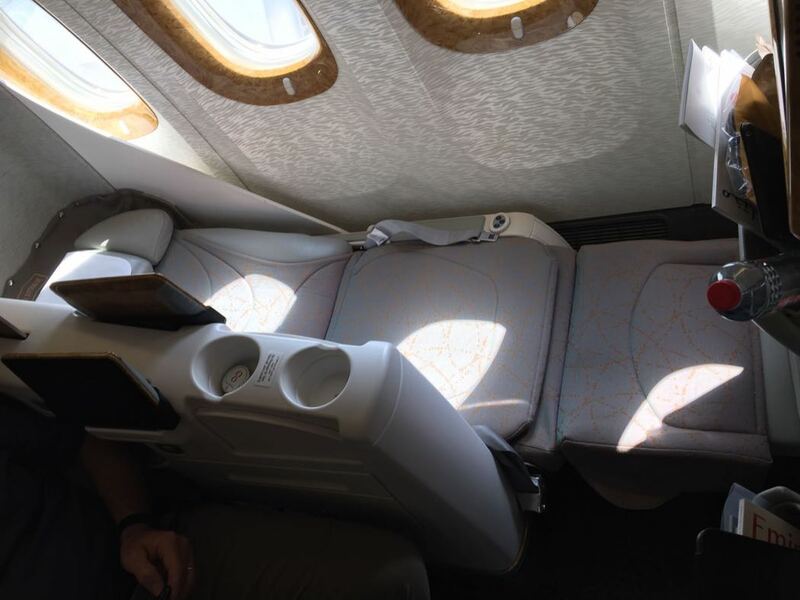 There is nowhere near as much space per passenger as on the A380. On both flights, quality blankets (a thin duvet) and cushions are on the seat as you arrive. 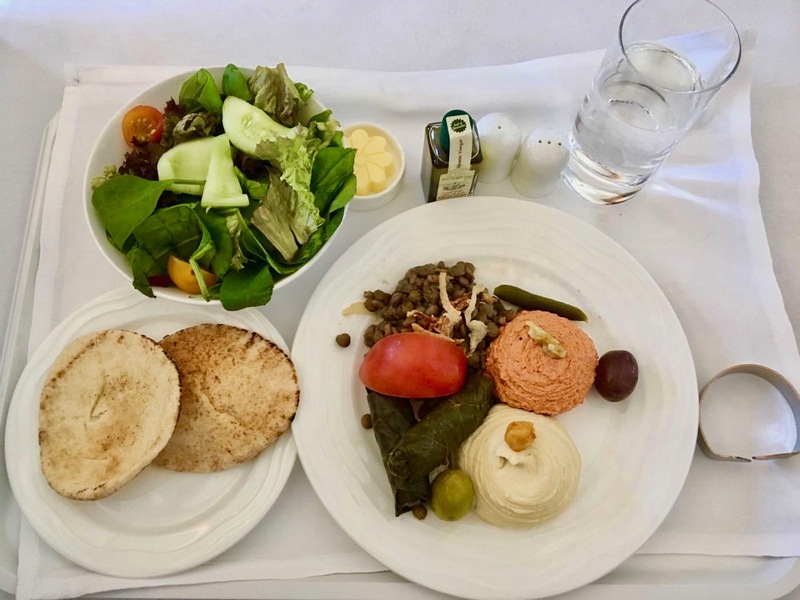 The food on both the A380 and the Boeing B777 planes was almost identical in standard, which is good news as you can expect to receive a consistent product on Emirates Business Class flights. 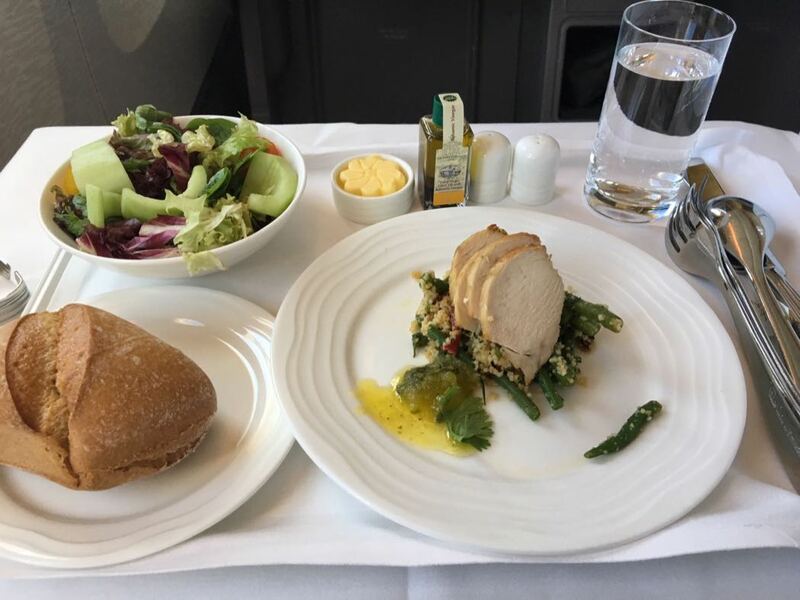 This was certainly a high-quality meal but I would say four star rather than five, I have had better food on British Airways Business Class but it was still delicious! 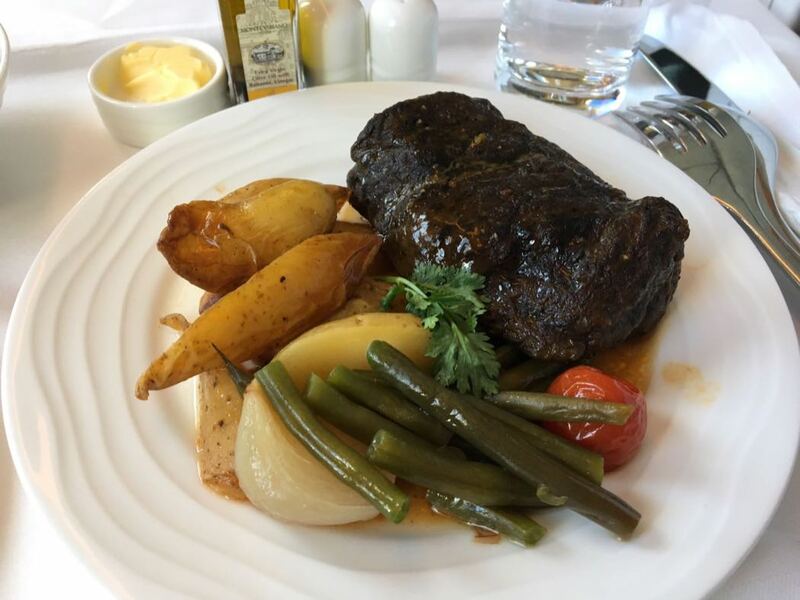 The only problem with the connecting flights was that on the second leg we’d already just had a main meal on the previous flight so didn’t want to eat much when the dinner was served on the second flight but then there was a long gap until the next meal arrived. Well, this is a seriously impressive in-flight entertainment system! The award-winning ice (information, communications, entertainment) system is just incredible; widescreen, over 2,500 channels of movies, TV shows, music and games, on demand and in multiple languages. There is a removable remote which I would expect, but also a removable tablet which I didn’t expect and this was an additional service that I haven’t personally experienced on flights previously. You can also follow the progress of your flight on the moving map, again very much an excepted service these days, but you can also see the views from the external cameras right on your screen – depending on what you’re flying over, this can be quite fascinating. Wi-Fi is available on all Emirates flights, while we didn’t make use of it, this is a great service to have available. 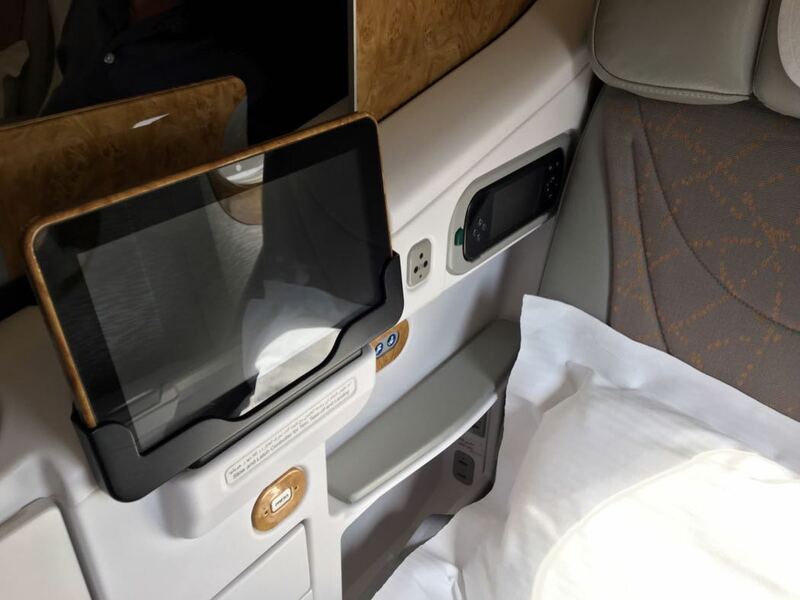 On the A380, every seat has a satellite telephone, plus onscreen email and SMS services, and you can even make calls to people on the ground due to the mobile phone and data roaming services. The service is really excellent, so good that you never really have to ask for anything much, they anticipate your needs very successfully. I did fancy a cup of tea at one point which was instantly provided, but generally you never even get so far as having to ask! 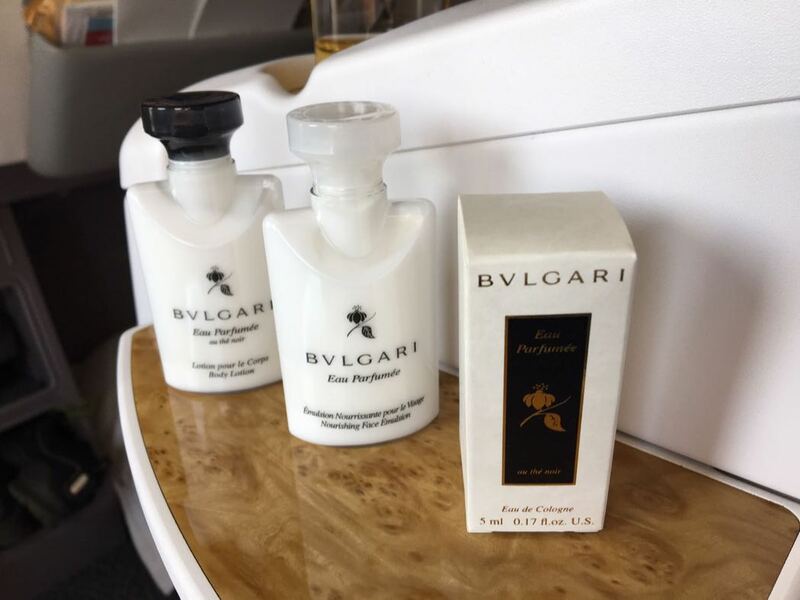 The amenity kit was provided by Bvlgari and was a very quality product, there a version for ladies and one for gentleman too. The door to door service that you receive with Emirates Business Class is exceptional. You are picked up from your house by a chauffeur (and with two of us travelling, we could have been picked up in two separate cars from separate locations but we chose to travel together!). This is inclusive for the first 70 miles and then you pay a supplement per mile after that. They would also have chauffeur-driven us to our destination but as we wished to have a hire car they also included this as part of the booking and we paid a single fee. 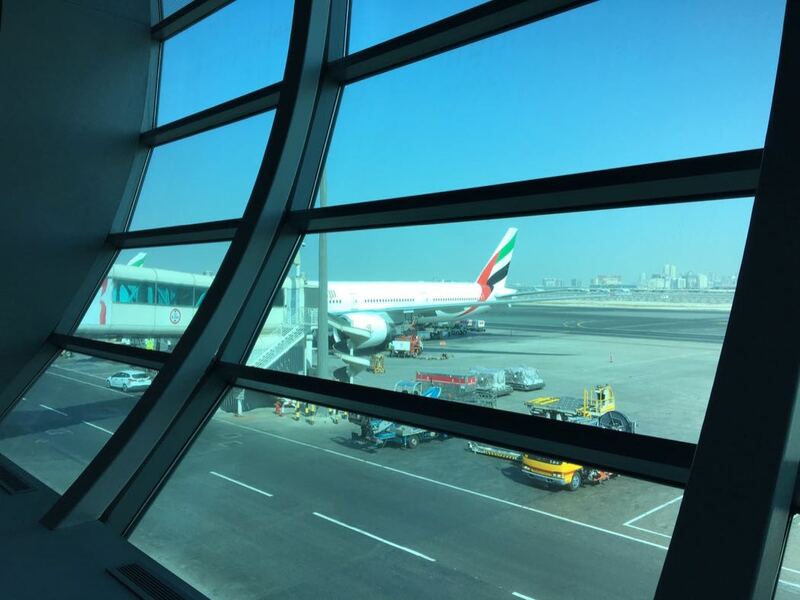 One very nice thing about flying Emirates from Heathrow Terminal 3 is that, as well as having business class security and passport control, you board directly from the lounge, so you totally avoid the hassle traipsing through the airport trying to find your gate. 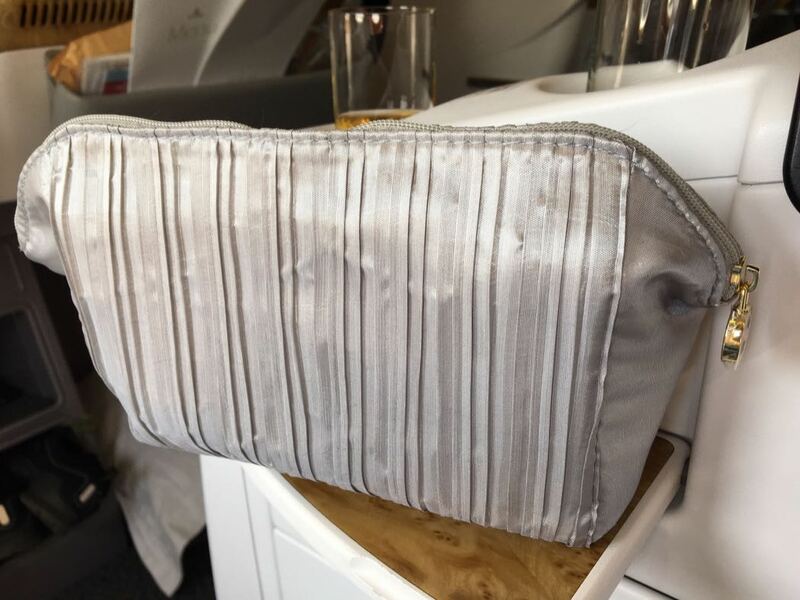 When we returned back home into Heathrow we went directly to the Emirates chauffeur lounge, after being served tea and coffee, the chauffeur reverses right up to the lounge (ideal as not even your baggage gets wet if it’s raining – which, of course, it was! ), they load your baggage and you’re off home – the perfect way to end your travels. 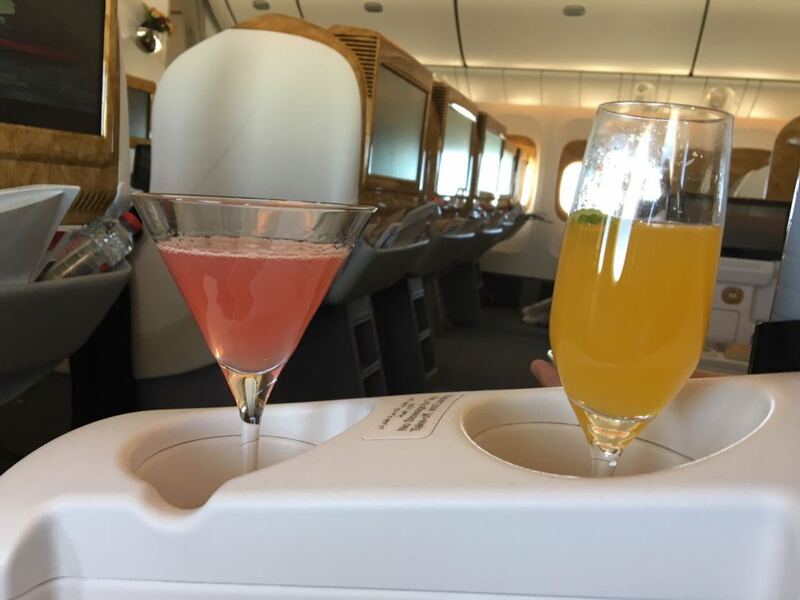 One interesting aside is that we had a rather complex booking requirement; myself and my husband wanted to fly business class, whereas our two sons were going to fly economy (they’re young for goodness sake! ), with them going at a slightly different time to us too. For convenience, I wanted all this to be done as one single, complete package, I tried several operators but they found it impossible to manage this until I contacted Dial-a-Flight who handled my slightly bizarre request with ease. Worth remembering for your more specific and unusual travel requirements. 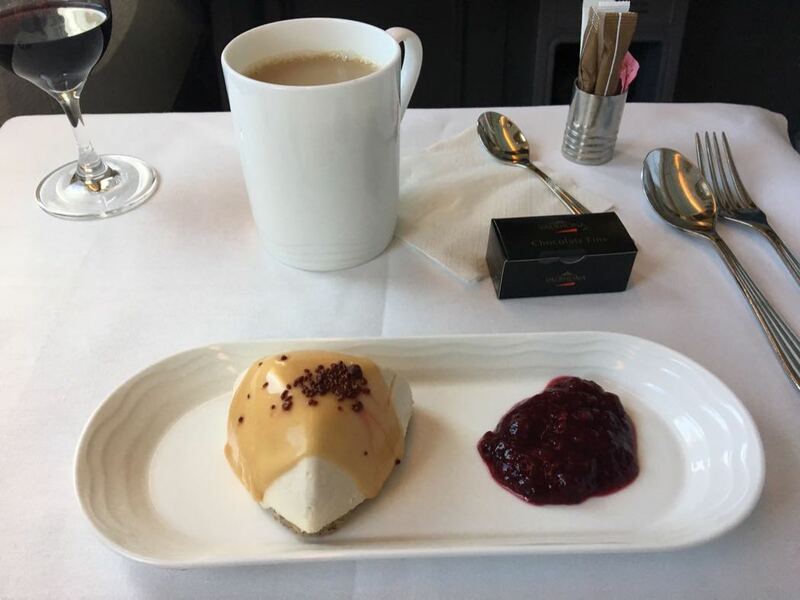 I would definitely fly Emirates Business Class again in the future, they really shine with regards to their service and you can tell that service is vitally important to them; the door to door approach and the general customer service are really first class. As for the planes themselves, the A380, as you would expect was certainly nicer than the B777-300, mainly because it was more spacious and of course, the lie down beds go flatter, but the general product and service offering was reassuringly consistent across both legs of the journey.